M'dasha is a Khajiit commoner residing in the village of Border Watch. Like his fellow townsfolk, M'dasha believes that once the three signs of K'sharra appears, it's the end of the world. He also believes the gods are watching over Border Watch, and therefore lives a relaxed existence, wandering around town every day between 4am and 10pm, only interrupted by a two hour dinner break at the Inn at 7pm. The exception to this routine is when the prophecy is fulfilled, and he will run around town in wild panic, and will continue to do so, until you complete the related quest. After that, he will return to his normal life, although a bit shaken and scared. He wields a high quality two-handed blunt weapon (best quality for your level) and a random piece of leveled light armor that he will equip during the final stages of the quest. His attire consist of a pair of breeches, oiled linen shoes and olive vest. He also carries around a random selection of spare clothing. 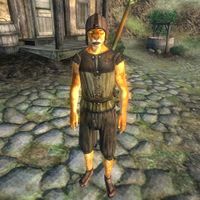 Like all the other inhabitants of Border Watch, he is a Khajiit of few words. However, after you have spoken to Sheogorath for the first time, he will guide you on to the town's shaman, Ri'Bassa. Sheogorath: Fulfill an apocalyptic prophecy to satisfy Sheogorath's morbid sense of humor. Esta página foi modificada pela última vez à(s) 02h09min de 26 de abril de 2013.